We consider US Venture Capital (VC) activity as a measure of entrepreneurship and study its relationship with the business cycle. This measure addresses some biases in alternative measures such as self-employment and business ownership that have been considered in previous literature. Despite the well-known volatility in VC activity, it remains an important source of funding for entrepreneurs engaging in innovative business creation. We document key stylized facts for VC entry (seed and start-up stage) and VC exit (late stage) at the aggregate and sectoral level. VC entry is more strongly correlated and is contemporaneous with the business cycle while VC exit lags the cycle by two quarters. There is strong evidence for a bi-directional causality between entrepreneurship and economic activity. A positive shock to VC activity has a positive effect on real GDP. Our findings can help inform policies designed to support entrepreneurship. Khan, H.U, & Petratos, Pythagoras. (2016). 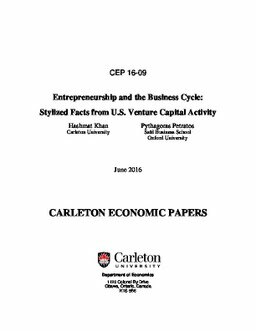 Entrepreneurship and the Business Cycle: Stylized Facts from U.S. Venture Capital Activity (No. CEP 16-09). Carleton Economic Papers (CEP). Department of Economics.